Tuesday, May 2, 2017. The polls will be open from 7 a.m. until 8 p.m. Absentee ballots will be available after March 25th. Why is this bond election necessary? The primary purpose of the bond election is to renovate and upgrade schools and school facilities, to replace school buses when they reach the end of their useful life, and to upgrade technology. The bond proposal is necessary to assure that Fraser’s schools and school facilities are up-to-date and in good repair. It was designed to protect the community’s investment in its schools. The bond proposal on the May ballot is an outgrowth of the school district’s strategic planning process, and will affect every Fraser Public School District student, school and school facility. How will the bond proposal affect my taxes? If voters approve the bond proposal, the current tax rate will not change. There will be no tax rate increase. None. Zero! Is this bond proposal related to the sinkhole problem? No. This bond issue has nothing to do with the sinkhole. It is also not a City of Fraser bond proposal. It relates only to the Fraser Public Schools. What’s included in the bond proposal? Of the $29.37 million requested, $20.8 million will be spent on construction project needs, including building improvements ($17.3 million), furniture and equipment ($2 million), and school buses ($1.5 million). An additional $8.5 million will be spent on technology needs. The remaining $70,000 will cover items such as underwriting, legal, and financial costs. It is important to note that the projects listed below are planned over the next five years. Many of the items in the bond proposal are still in working condition and will continue to be used until that is not the case. For example, the football field is projected to last until 2022 before needing replacement. These items are included in the bond proposal now because they can be accommodated without a tax rate increase. Note that all projects have been approved by the Michigan Department of Treasury. Install underground storm water drainage. The current system allows water and ice to build up on sidewalks and play areas. Replace classroom coat cubbies, many of which are deteriorating or broken. Add air conditioning to gymnasiums and kitchen. These spaces are used for assemblies, lunches and classes, and get very warm when several hundred students and teachers are inside. Add flexible furniture to classrooms to allow for collaboration, small group instruction, and personalized learning. Replace leaking roofs at Salk Elementary and Eisenhower Elementary. The roofs are also failing where they have been previously repaired and patched. Add a parking lane along the east side of the parking lot at Salk Elementary to ease student drop-off and pick-up traffic. Replace the leaking roof over 80’s wing and art wing. Upgrade the HVAC system to more efficiently control the climate inside the school. Install underground storm water drainage. The current system allows water and ice to build up on sidewalks. Add air conditioning to gymnasium. The gym is used for assemblies and classes and becomes very warm when people are inside. There are no windows or doors to allow for better air flow. Replace inefficient parking lot lights outside of the Idea Lab. Replace worn out stage curtains. Upgrade the elevator (which was installed when the school was opened in 1970) to ADA specifications. Update classroom technology and infrastructure when it reaches the end of its useful lifespan. Purchase laptops for all 9-12 grade students. Laptops will allow students to engage in more projects and assignments and, further allow for personalized learning. Renovate locker rooms, which were installed when the school opened in 1970. Many locker doors are missing or broken, making the lockers unusable. Why will bond revenue be used to replace buses? School buses typically reach the end of their useful life when they are 8-10 years old and/or have high odometer readings. Without bond revenue to purchase buses, they would have to be financed by the general operating budget (which would mean taking money from the classroom and educational programs). What will happen if voters do not approve the bond proposal? The proposed bond projects cannot be addressed because they exceed the capacity of the general fund budget. Will all bond proposal revenue stay in the Fraser Public School District? Yes. All revenue from the bond proposal will stay in the Fraser Public School District. None of the revenue will go to Lansing or to any other school district or political entity. The bond funds can only be used for bond proposal projects and cannot be used for salaries. Will any of the bond revenue be used to pay sinkhole-related costs? No. This bond is solely for the Fraser Public Schools. None of the revenue will go to the City of Fraser, Macomb County, or the sinkhole. If the bond proposal is approved by voters, will property values be affected? Real estate values tend to be higher in communities with school districts that offer a quality education program and have up-to-date school facilities. Property values tend to be lower in communities that do not offer an adequate curriculum or that have schools that are out-of-date and poorly maintained. Remodeling and upgrading school buildings and facilities tends to protect the community’s investment in the school district. In fact, all of Fraser’s bond proposal projects were designed to reflect positively on homeowner property values and the community’s reputation for being a well run and a desirable place to live. Why is the election in May? A May election will allow the school district to begin some projects during the summer months when students are not in school. What technology is included in the bond proposal? Classroom projectors, document cameras, sound systems, digital chalkboards, and screen sharing devices will be updated, as well as the network firewall, network switches, servers, cabling, charging cabinets, wifi access points, PC desktops & laptops, printers, telephones and other infrastructure. Most of Fraser’s technology was purchased between 2005 and 2012, making the it 5-12 years old. In the technology world, that’s a long time. Getting replacement parts and service is becoming an issue. When we update the technology in a planned schedule, consistency and simplicity come with it. Our goal is to finish the majority of the technology updates (about 85%) within 36 months. We plan to use the current technology as long as possible and replace it at the end of its useful lifespan. Our technology includes about 5,500 student devices, 600 staff devices, 300 classroom projectors, 550 security cameras, 500 wifi access points and more, so there is a lot to be done. We will minimize the disruption to learning and accomplish as much as possible during the summer months. Who pays if a student damages a computer or laptop? As is the case with textbooks, students share some of the cost responsibility for damage and excessive wear and tear to computing devices. Students are charged $25 for the first repair, $75 for the second repair, and the full cost of a third repair. If a student’s computer or laptop is lost or stolen, the student pays the full cost of replacement. What is a bond proposal? A bond is a State-approved funding process that specifies a set scope of projects. When voters approve a bond, the money specified in the bond proposal is borrowed and the school district makes payments over a period of years, much like a homeowner pays a mortgage. Bonds are usually issued for 20-30 years. The 30-year bond proposal on the May 2nd ballot will authorize the Fraser Public School District to issue bonds in the amount of 29.37 million dollars. The proceeds from the sale of the bonds will be used to pay for the projects included in the bond proposal. Technology purchases limited to hardware and communication devices that transmit, receive or compute information for pupil instructional purposes only. The initial purchase of operating system and customized application software is allowed if purchased with the initial hardware. Computer training, computer consulting, or computer maintenance contracts. Can any of the bond proposal funds be used for employee salaries or operating expenses? No. Bond proposal funds cannot be used for staff wages, salaries, or operational costs. They also cannot be used for repair or maintenance costs or other operating expenses. Bond proposal funds must be used only for purposes specified in the ballot language, and, as required by State law, they must be audited. Will taxes go down if I vote no? Taxes will not go down if this bond proposal does not pass. Here’s why: The School District currently levies 7 debt mills to repay the existing debt. The debt millage is projected to stay at 7 mills until 2031 whether the May 2nd bond proposal is approved or not approved. What is the ballot wording? Below is the actual ballot wording. A YES vote means that you are in favor of the bond proposal; a NO vote means that you are opposed to the bond proposal. Preparing, developing and improving sites at school buildings, playgrounds, athletic fields and other facilities and the purchase of school buses? The maximum number of years the bonds may be outstanding, exclusive of refunding, is not more than 30 years; the estimated millage that will be levied to pay the proposed bonds in the first year is -0- mills (which is equal to $0.00 per $1,000 of taxable value); and the estimated simple average annual millage that will be required to retire the bonds is 2.98 mills annually ($2.98 per $1,000 of taxable value). If approved by the voters, the bonds will be guaranteed by the State under the School Bond Qualification and Loan Program (the “Program”). The School District currently has $60,070,000 of qualified bonds outstanding and approximately $7,037,666 of qualified loans outstanding under the Program. The School District expects to borrow from the Program to pay debt service on these bonds. The estimated total principal amount of additional borrowing is $22,467,959 and the estimated total interest thereon is $35,245,283. The estimated duration of the millage levy associated with that borrowing is 29 years and the estimated computed millage rate for such levy is 7.00 mills. The estimated computed millage rate required to be levied to pay the proposed bonds may change in the future based on changes in certain circumstances. The estimated first year millage levy for the proposed bonds is indicated in the ballot language as -0-. Is this truly a zero increase bond? Yes. The School District’s current outstanding voter approved bonds have been issued as “qualified bonds” under the Michigan School Bond Qualification and Loan Program (SBQLP). The current computed debt millage under the SBQLP is at 7 mills. If the 2017 bonds are issued, the computed debt millage cap will remain at 7 mills so there will be no increase in the debt millage. What is the simple average annual debt millage of 2.98 mills referenced in the three paragraphs at the bottom of the ballot? The simple average debt millage is the estimate of the amount of additional debt mills required to be levied to fully repay the 2017 Bonds over the 30 year term. These debt mills will repay the qualified bonds and the loans borrowed from the State. This average annual debt millage is an estimate of the cost to the taxpayers of the proposed Bonds over the full life of the Bonds. However, the current projection indicates that 7 mills will be sufficient to repay the School District’s debt without the necessity to increase the millage rate. Who pays the debt millage and what will it cost? The debt millage is levied every year on residential and non-residential property in the School District. The proposed bond will not increase the number of mills that is levied on property in the Fraser Public School District. Has the School District’s Debt decreased since the 2011 Bond? Yes. 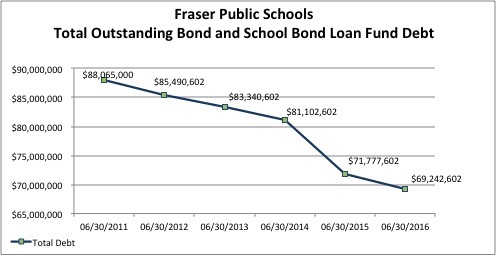 The following chart shows the history of the School District’s outstanding Bond and School Bond Loan Fund Debt. The total debt has been reduced from just over $88 million to approximately $69.2 million in five years (between June 30, 2011 and June 30, 2016). Why did the School District recently refinance its debt? The School District has always been fiscally responsible in managing its debt. In February 2015, the School District completed a $46,925,000 refunding transaction which is similar to re-mortgaging a home. This transaction resulted in a reduction of our total debt service payments over the following 16 years by over $6.77 million dollars. Why doesn’t lottery money pay for schools? On lottery tickets it says that the Michigan lottery supports education. BUT here is what really has happened to lottery revenue: Say the lottery generates $1 million. That money goes to the State of Michigan’s general fund. The State of Michigan then puts the $1 million in lottery money in the school aid fund BUT the State has a history of taking an equal amount from the school aid fund and putting it back in the general fund. That makes the net gain for education zero. The Michigan lottery has been trumpeted as the way to fund schools. That has never been the case, yet many Michiganders continue to ask how schools spent “all the lottery money.” Truth be told, lottery money has not made a significant difference in school funding. Who can vote in this bond proposal election? Residents of the Fraser Public School District who will be 18 years of age or older on Election Day, and are registered to vote by April 3, 2017. Where can I get information about voting (such as how to register, where to vote, and absentee voting)? Go to the Michigan Voter Information website (webapps.sos.state.mi.us) or call the Clerk’s Office where you reside. Do I need to update my voter registration? You need to update your voter registration if you have changed your name or address since the last time you voted. You can do this at any Secretary of State Office or at the Clerk’s Office where you reside. They cannot attend the polls due to religious reasons. Absentee ballots will be available to voters after March 25. The Clerk will mail absentee ballot applications to residents on the permanent absentee voter list before or shortly after March 25. After March 25, voters can complete their absentee ballot application and vote in one stop at their Clerk’s Office. The whole process takes less than five minutes. Can I download this FAQ? I would like to share it with others. You can share this page with others electronically through the link: www.fraser.k12.mi.us/BondFAQ. You may also download a PDF of this document.